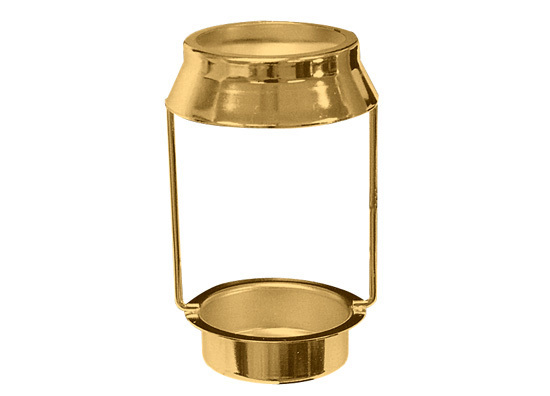 Candle Lamp Shade Holder is brightly brass plated metal that resists tarnishing. Candle Lamp Shade Holder Candle Cup Holds Standard Warming /Tealight Candles. Candle Lamp Shade Holder with Candle Cup. Bright Brass Finish. 2" O.D. shade top tapers to 2-1/2" O.D. bottom. 3-1/8"H plus 5/8"H bottom cup. Cup fits 1-5/8" dia. Hole. Note: Candle Lamps W/Shade Holders will accept lamp shades made from ceramics, glass etc. that will fit specific dimensions of Shade Holders. Important: Shades used with these holders must be fireproof.